Valis III (ヴァリスIII) is a 1990 action game for the TurboGrafx-16 CD by Telenet Japan. It was ported to the Sega Mega Drive in 1991 and released in the US and Japan. It was the first Valis game released on a Sega system (the first two games would follow). After the events of Valis II, the Dark world [sic] is being destroyed. The fortuneteller Leigh informs the Dark world's king, Glames, that they only have six months before it is destroyed. Hopeless, Glames decides to become king of both the Human world and Dreamland, but knows that Nizetti is controlling the power level of the Valis sword and that any attempt to invade either world would result in Yuko coming with a full-powered Valis to destroy him. Nevertheless, he takes the risk, knowing his sword Leethus, is just as powerful as Valis and when they are combined... ! You can play as either Yuko or Cham, using to switch (though some levels can only be played as either Yuko or Cham, and the first level can only be played as Yuko as you must rescue Cham first). attacks; + performs a magic attack. + slides. jumps. + jumps higher. Breaking open various jewels reveals items. Hearts recover health; blue crystals recover magic energy, and swords increase the power of the character's weapon. Dialogue is interspersed throughout the game; hit to progress. Special thanks to: Business suport Co.,Ltd. Original game licensed by: Shin-nihon Laser Soft Co.,Ltd. Main article: Valis III/Magazine articles. 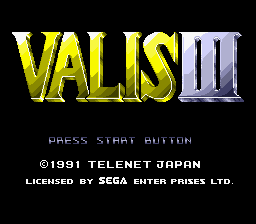 NEC Retro has more information related to Valis III.